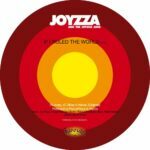 Joyzza & The Joyous Juice present their first single, « If I Ruled The World / She Song », released March 26th 2012 on Digital. These tracks, recorded at Colorblind Studios in Paris, are part of a project including Joy Poirel, a Franco-British singer-songwriter, and the three musicians who gave her the great honor of playing with her; Florian “Flow” Pellissier on keys, Thibaut Brandalise on drums and Virgile Raffaeli on bass. Joy has been dabbling in music for a while now, distilling soft, soulful vocals and intense lyrics, never happier than when howling with laughter at the crazy musicianship of her peers and idols. Virgile Raffaëlli’s sense of music stems from intuition and vibe. Mainly influenced by funk, rare groove, and soul, he fingers glide over his bass with obvious skill and experience. He’s played with several different bands since the age of 14 and also composes in his spare time, under the name Boastful. Thibaut Brandalise has played the drums since he could just about stand up, having traveled the world and managed to play with whomever he could get a hold of. He has been a full time musician for the past two years, playing at prestigious jazz clubs in Paris such as the Sunset, the Duc des Lombards as well as several festivals such as the St Louis International Jazz Festival, the Saint-Germain Festival, and Jazz à Vannes. Joyzza & The Joyous Juice present their first single, "If I Ruled The World / She Song", released March 26th 2012 on Digital.